Temperature Actuated mixing valve that mixes hot water with cold to deliver water at a controlled temperature up to 176 F (80 C) maximum. High flow rate design for lower pressure losses within the system. Robust, low complexity construction. Integral union connections on all three ports. Easy and quick to install and service. Every valve is tested prior to shipping. The 110-HX also features an adjustable, lockable handle to prevent tampering. Increased outlet temperature range extending to 176 F (80 C), making it ideal for application in heating systems. It also has applications in any installation requiring the delivery of reduced temperature hot water. 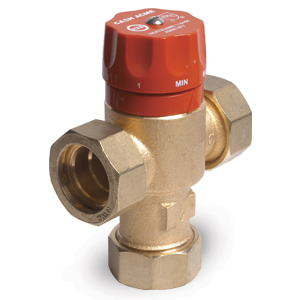 The 110-HX is certified to ASSE 1017 & CSA B125 and is listed by ASSE and IAPMO.